Massage, done according to the natural laws of human anatomy and energy flow, offers the most pleasurable benefit of all daily practices. Regular massage vibrates and energizes the skin, muscles and nerves simultaneously and helps the body become light, active and full of vitality. Body heat and vitality increase as the heart and circulatory system open up to provide fresh oxygen and energy to all parts of the system while simultaneously flushing out waste gases and chemicals. "Diseases do not go near one who massages his feet before sleeping, just as snakes do not approach eagles." There is new acceptance of massage nowadays. In the West people are especially interested in this art as a rejuvenator and vitalizer. 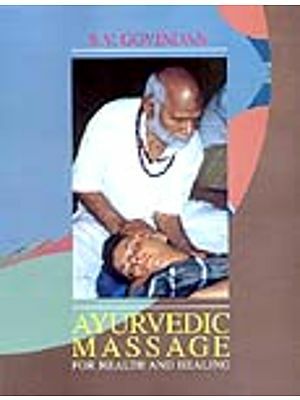 There is much literature available on various kinds of massage from different parts of the world, but there is no book about the ancient Indian system of massage where the art is ever popular. In India you can find people massaging people on beaches, on the banks of rivers, and in market places apart from the privacy of homes and wrestling places (akharas). Massage of children is widespread in Indian practically every child and the mother of each new born infant gets regular massage, as one gets foods. 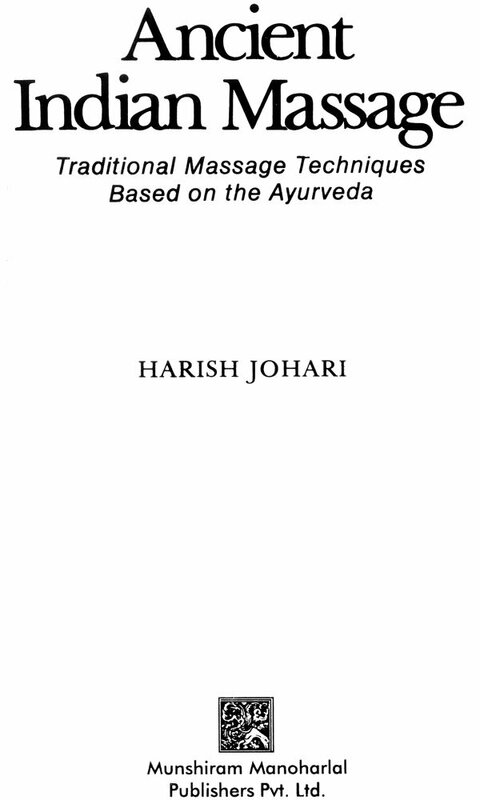 Massage is part of inherent rituals in Indian life and in many states it becomes a significant ritual before marriage. 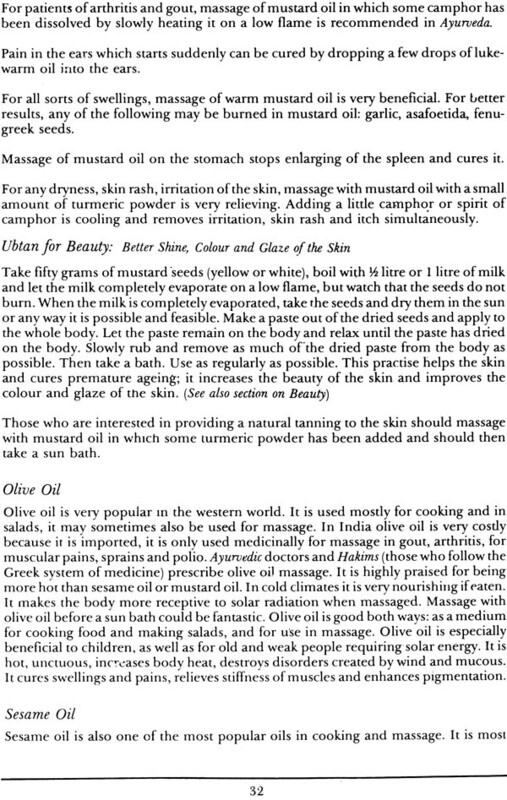 The purpose of this publication is to portray simply and factually some of the principles, techniques, beauty and benefits of massage. Special formulae have been incorporated to enhance various therapeutic values. Harish Johari (1934-1999) was an artist; a musicologist; a dramatist; a philosopher; and a translator. He was also a physiologist, a historian and an expert cinematographer. He was revered for his art of story telling and for his beautiful sculptures. He has published several books, which have been translated into several languages. Employing a unique medium, he executed extraordinary works on paper and silk, and eighteen of his paintings have been published by Verkerke, Holland. As food is a necessity for the organism from birth to death, so is massage to the human organism. Food provides nourishment from external sources to the organism, whereas massage excites the internal resources and provides nourishment in the form of proteins, glucose, and other vitalizing chemicals, which are within the system. Massage, like a mother, preserves the body energy and saves the organism from decay. It also works as a cleanser and helps the organism in discharging toxins out of the body through sweat, urine and mucous; thus rejuvenating the body. Message is the first friend, which serves the human organism from the time of birth. In India it is a tradition to massage the body from the first day, which continues to at least the third year everyday. After three years of age the routine changes and massage is done at least once or twice a week, up to about the sixth year. Afterwards the child is able to massage others and get massage in return. This continues until he starts playing and doing physical exercises. Weekly massage is a family scene, everyone does it. With the advance of age when a child attains the state of youth, he/she gets interested in building the body. The next stage comes when one gets married and receives the massage from his/her partner (the wife gives her husband massage every day till the end of her life). In old age there are grandchildren to play with and give massage to the grandparents. Thus, for the majority, massage is a part of life. There are also ceremonial massages. The one which is compulsory is massage before marriage, which provides the glaze and the look of a bride/bridegroom to the young couple. 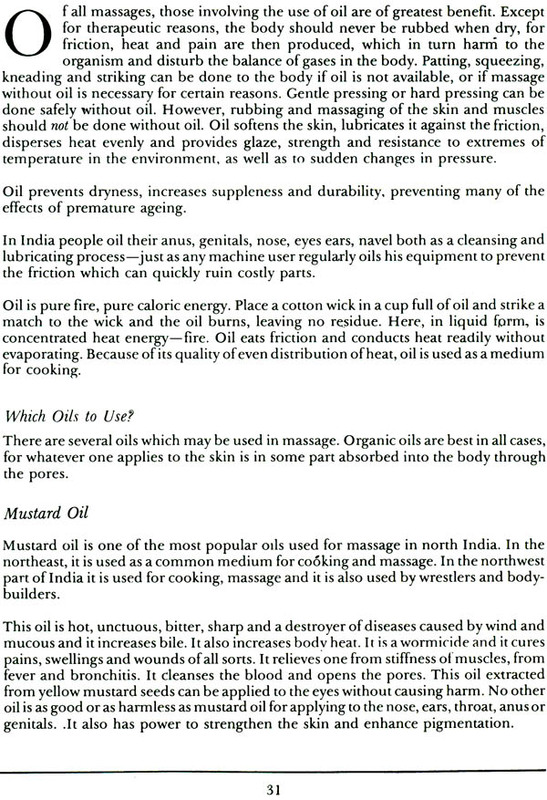 This massage is done with chemicals and oils. Massage before marriage relaxes the one being married, gives stamina, provides psychic strength and increases beauty. Another compulsory massage is to a lady after the delivery of a child. This massage is done daily for minimum 40 days. In ancient days, life was simple and close to nature. Modern age is the age of greed and competition. Life has become strenuous. There is stress on the nerves every moment. In this modern age of stress and strain massage is a must. The speed of everything has increased and there are unnatural shocks shaking the nervous system every moment. The literature now available on massage shows an inner urge in people in the western world to find natural methods of relaxing and vitalizing the human organism. Massage is the most natural and powerful method of relaxing and at the same time rejuvenating the body. It is now becoming known to many people that this modern way of living is not right, yet it is impossible to go back to Nature and start living once again in the way our ancestors lived five hundred years ago. We shall have to avoid the use of drugs and chemicals in order to keep our body chemistry in good shape. Some chemicals used, as preservatives have become part of our food industry. We cannot avoid these if we do not discard packaged food, milk and cheese which is almost impossible if we live in this era. So there remains only one alternative to learn and practice such devices which would help the system flush out these toxins as regularly as they are ingested. The skin also plays a very important role in excreting waste materials and toxins. Massage is one of the few well-known remedies for helping all such problems. 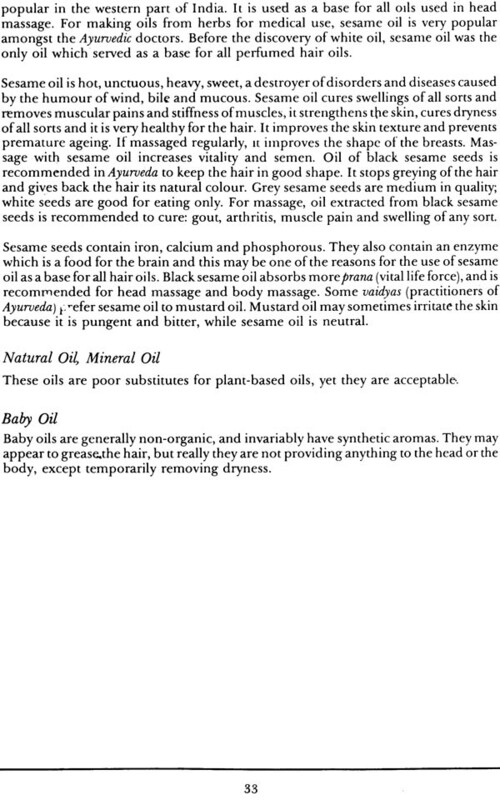 The use of natural, organic foods; water; earth; sunlight and air (along with massage) can prove a fantastic remedy. Rubbing of the body produces heat and increases blood circulation, it affects the lymphatic system and supplies more nourishment to the blood. Through touch, massage works on the nervous system and effects the circulation of growth hormones. All feelings and fantasies of the massager are transmitted to the person getting the massage. As a child massage was given to me everyday but I do not remember myself as a small baby. When I recall my childhood I find myself massaging the holy feet of my mother sometimes  and most of the time I see myself giving massage to my on the subject how to massage. This was just a play, so far as I remember I learnt how to massage properly in 1949 and later on it 1952-53 it became a part of my daily routine when I joined the wrestling ground (Akhara) at Jaunpur, which was situated right in front of my house. Massage was essential for all who came to the wrestling ground. Srhi Jaswanta Singh Mukhtar (Advocate)- our landlord  was very interested in wrestling- and massage and he appointed Pabbar Pahalwan (Wrestler) to come and instruct me in wrestling and massage. Ustad Pabbar Pahalwan was a wrester of provincial fame specially very popular in Eastern Uttar Pradesh, because of his engagements he could not come popular in Eastern Uttar Pradesh, because of his engagements he could not come regularly to teach me and most of my training was done under Shri Jaswanta Singh himself besides Shri Bhrigu Nath and Bodhan- famous wrestlers of Janupur. To massage the teachers and to get massaged by them was very healthy; it increased my stamina, vigour, vitality and inner strength, gave me self control, strong well-power and endurance, which later helped me in my work as a sculptor. In 1957-58 while I was living at Rampur I had the fortune of meeting the most handsome and wise wrestler Siddique Khan, son of the famous royal wrestler of Rampur Sohrab Khan, who was also a healer. Siddique Bhai agreed to instruct me in wrestling and in art of massage. 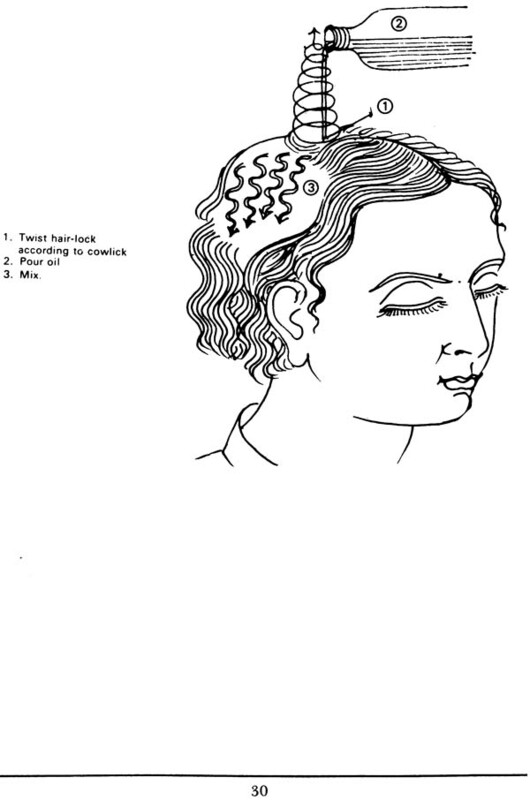 Siddique Khan brough my attention to the MARMAS (vital points) and explained to me secrets of rubbing, kneading and squeezing. My understanding about massage was further enriched by my Ayurvedic medicine man friend and teacher Shri Rameshwar Prasad Pande. He prescribed massage to his patients very frequently and was able to achieve quick recovery with a combined effect of medicine, diet and massage. It was here in his enlightened company I learnt about the three humours Wind, Bile and Mucous. Oil massage and massage of pressure points made a deep impression on my mind and when I came to the Western Hemisphere I was astonished to see that very few persons here massaged with oil. Massage is very essential for people living in cold climate. Cold climate, lack of exercises and more intellectual work- all combined together create dryness and poor circulation of blood in the body and massage is the only remedy which could help a healthy and wholesome growth of body and mind. I thank my teachers and students, who helped me in making the present book on massage, which can provide some practical help to people interested in physical and mental well being. I thank my student Dan Conrod for making the primary drawings of massage book which later on I improved and made them suitable for the book. Treating balance in one's own body depends upon proper nutrition adequate sleep and proper exercise. Working with these areas of body maintenance will help to assure a long and productive life. With the passage of time, however, balancing these factors becomes increasingly difficult. Exercise, for example, frequently becomes inadequate with advancing age bringing about a number of serious emotional and physical problems. Each of these areas of bodily maintenance has fascinated scientists and physicians throughout history and around the world. Ancient Greek and Roman physicians, thought about the body in terms of keeping it in balance by manipulating these pillars of good health. The Eastern medicine of the Hindus and Chinese of today is likewise concerned with balance. The Hindus, for example, use techniques preserved in the Sanskrit texts as old as 2,500 year- back at least 2,500 years which deal with this art of maintaining balance in the body. This system is called the Ayurveda, literally translated as the science of longevity. Ayurveda, like the Chinese Acupuncture system, is principally concerned with the individual's balance in diet and everyday living habits so that he stays free of physical and emotional diseases. These Indian doctors give a different diet for each person that changes with the seasons of the year and even with the days of the week. Both systems also work by adjusting the intercellular fluid in the body .he organic, which we call lymph, in order to create an electrical and chemical balance among organ systems to preserve their proper functioning. 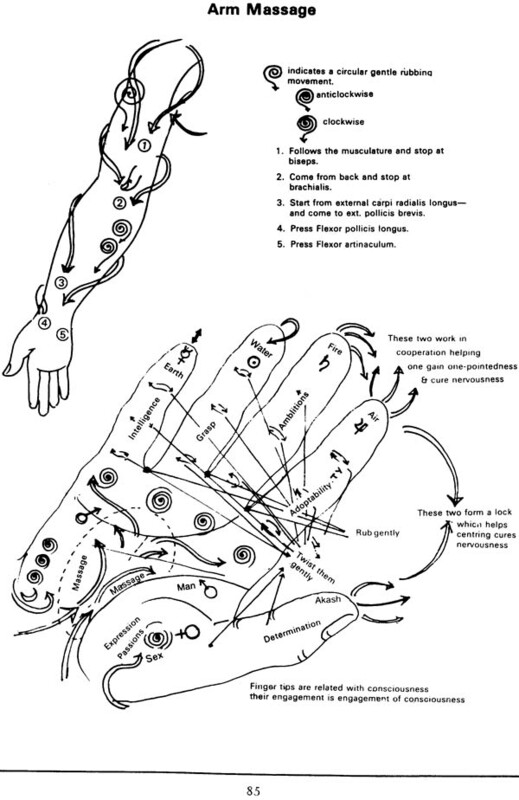 Acupuncturists use needles, local skin heating and massage to effect this probable balancing of the DC currents in the lymph where as' the Hindus use, oil massage of the foot or hand to accomplish many of the same things. As with all knowledge, this concern for balancing has recycled to catch the attention of modern scientists. And, like many rediscovered ancient ideas, these concepts of health seem to agree, in some areas, with modern medical research data from the West. This linkage of ancient and modern may provide new techniques to be used in the practice of one's personal routine of preventive health care. As everyman becomes more able to deal with his own body balance, he will not only have less disease but he will also be physically and emotionally stronger and a great deal happier. The concept of preventive medicine is new in the United States but will undoubtedly find a, place in our culture. We are reaching a point where we are becoming increasingly more conscious of our bodies and the need to keep them in the best possible condition. Staying in the best condition reflects in all our life's activities- both for work and play. Daily balancing of our physical vehicle provides not only maximum performance with optimum wear but also a richer emotional life. One topic of current interest in our investigations of new and ancient techniques for balancing is the Lymphatic massage. We will examine its importance for Westerners, especially for gerontology, and look at the interesting scientific correlations of this technique. The Lymphatic massage has rather striking effects, especially relaxation of the subject, which 'makes it a likely candidate to be used as a therapeutic tool in the West. A look at the lymphatic system from the point of view of the East and West is very interesting. This system has received very little attention by Western scientists until recent years primarily 'because of its delicate nature and the ease with which these vessels can be overlooked or disrupted on gross disection of the body. This system which is quite necessary for our survival has been studied recently in connection with cancer research by more refined microscopic and staining techniques which enable scientists to better understand lymph flow as well as lymph constituents. Although a comprehensive review of lymph is beyond the scope of this book, we will attempt to provide a few basic facts about the lymphatic system. Lymph is found everywhere outside the cells in the human body with the exceptions of the brain, bone marrow and deep inside skeletal muscle. It is a clear or milky coloured fluid which originates by leakage from blood capillaries. This system carries nutrients to the cells and waste products and foreign particles away from the cells, it then passes into small lymph vessels. These delicate lymph vessels can distend up to six times larger than the accompanying vein but are usually only slightly larger. These lymph vessels travel a short distance and then enter a lymph node. Here if there are any bacteria, viruses, foreign particles or cellular debris in the lymph they will be eaten by large cells in the lymph node and be destroyed. Another lymph vessel takes out the freshly cleaned lymph from the other side of the lymph node and moves it on to the heart. Lymph vessels have valves so that the fluid flows in only one direction-towards the heart. The lymph flow finally rejoins the blood stream at the base of the neck where the largest lymphatic collecting vessel, called the thoracic duct, empties its lymph into the internal jugular vein and there it mixes with the blood. Lymph has many elements which make it important for the body maintenance. It contains roughly half the concentration of protein one finds in blood plasma. Since lymph flows back into the blood stream at a rate of one to six quarts per day, depending upon the amount of exercise, it is equivalent to giving six units of blood plasma intraveinously per day. This system returns the serum proteins to the blood which escape normally into the lymphatic space. This is very large amount of protein every day. The body literally feeds itself with its own preprocessed food or lymph. It seems reasonable that a great diminution of this protein rich fluid would alter the body's metabolism. As it has been widely evidenced that the rate of lymph flow depends upon several variables. For example, a subject who is lying in bed in poor physical condition may have as little as one quart of lymph recirculated into the blood stream daily whereas an active ambulatory subject can have as much as six quarts of lymph returned to his circulation in a day. It is interesting that lymph, for the most part depends on muscular contraction to make it flow back toward the heart, Lymph from arms, legs and head does not move measurably while at rest. It is very frequently mentioned by experimenters in this field that as a part of their routine of collection of lymph samples it is necessary to massage the area of interest to get the lymph to flow at all. Massage greatly increases lymph flow. In one experiment, lymph flow was measured in the hind leg of a dog. At rest no lymph flowed, but by rhythmically squeezing the paw of that leg pressure increased in the lymph vessel from 0 to 50 centimeters of water. Among the many important aspects of lymph physiology, we might mention that lymph contains a great number of lymphocytes which are the white blood cells (w b c) responsible for maintaining the body's circulating immunological resistance. A large portion of these infection fighting cells are formed in the lymph nodes. The thoracic duct output of these white blood cells in man per day is equal to the total amount of these cells in the blood, in the rat it is twenty-seven times as great. By and large the composition of lymph is similar to that of blood plasma. There are, however, some exceptions which may prove to be of interest. Lymph contains a significant amount of the essential amino acid tryptophan when compared with dietary intake and blood levels of this relatively scare but important compound. Tryptophan is necessary for serotonin and melatonin formation which are important body substances necessary for energy production and nervous and hormonal balance. Lymph contains high levels of all other amino acids, proteins (especially rich in albumin) and most body enzymes. Of interest among these enzymes are high levels of dopamine beta hydroxylase (implicated in the pathogenesis of schizophrenia) and histaminase, the enzyme which breaks down histamine. When histamine levels in the body become elevated it can cause high gastric acidity, lethargy, itching, headaches, painful muscles and painful lymph nodes. Histamine is also the major chemical involved in the body's allergic response. These allergic phenomena, such as hay fever, manifest by symptoms of swelling and inflammation of the nasal mucous membranes, nasal obstruction, reddening of the eyes, itching and cough. Indeed, one might speculate that lymph, which has thirty times as much histaminase as blood, could be the body's own natural anti- histamine. There are many other interesting correlations which link one's state of health with one's state of lymphatic functioning. At this point however, let us look at the Eastern medicine approach, especially Lymphatic Massage and see how they view this system. The Indian Ayurvedic system of medicine calls the lymph system the Kapha or mucous carrying system. 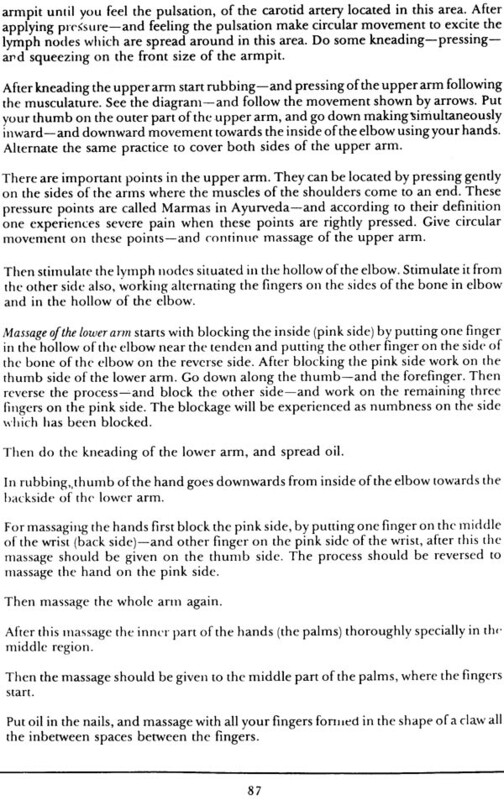 This tradition developed a massage that includes pressure points (they correspond remarkably with the anatomical position of lymph nodes) which are gently massaged with organic oils (principally mustard seed oil, coconut oil, and almond oil) to achieve a balance in the body's energy system. Kapha has been interpreted by modern Vedyas (Ayurvedic doctors) as being a property of lymph. Increasing the Kapha activity is purported to increase the nourishment of the body and give proper articulation of joints, fortitude, patience, solidarity, sexual stamina and abstinence. Most frequently this massage is performed by massaging only the feet, the hands, or the head of the recipient. Through regular massage, they feel that the balance is restored to the body's electro-chemical pathways and serves as a preventive health technique. In the Hindu culture this massage is generally performed within the family or extended family with children massaging the grandparents in the household and husband and wife exchanging massage. Youthful energy is thus circulated throughout the household. The subjective effects include rapid relaxation that frequently results in light sleep. It is also useful to relieve pain of skeletal muscle origin and may find utility in elevating mood. Some of our patients who have received this massage describe feelings of peacefulness and diminished anxiety. If this observation holds true, it could be a valuable new tool to produce mental relaxation by a simple physical technique. In Acupuncture, at least part of the effect is derived from stimulation of lymph. 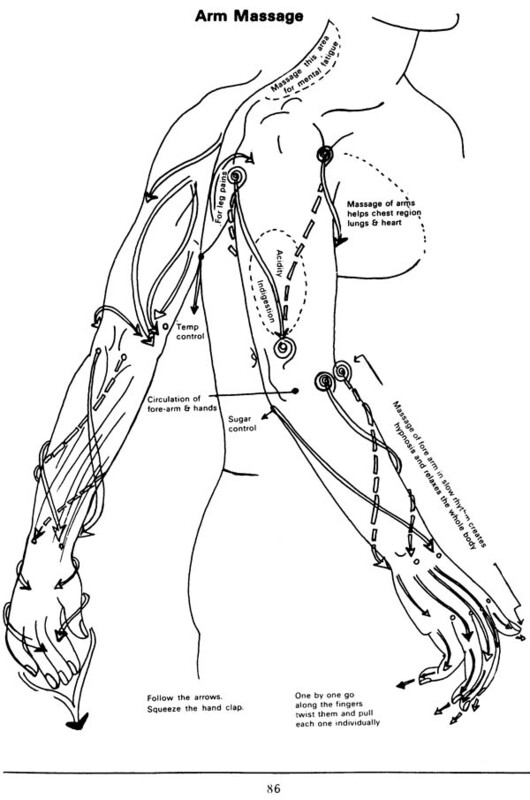 In fact, a map of the Acupuncture points corresponds quite well to a chart of the body's lymph nodes. Acupuncturists feel that they are dealing with the electrical currents present in the body and that by manipulation of the intercellular fluid or lymph with needles, moxybustion (heating) or massage these electrical fields can be balanced. They also recommend balancing at regular intervals to prevent the onset of disease which results from imbalance in this system. The implications of these approaches to preventive medicine and body balancing could be extremely important for the Western patient. This massage technique also provides an avenue to make new physical contact between the young and the old. For example, students and volunteers could easily learn and use this massage with geriatrics patients on hospital in-patient services and for senior citizens in general.